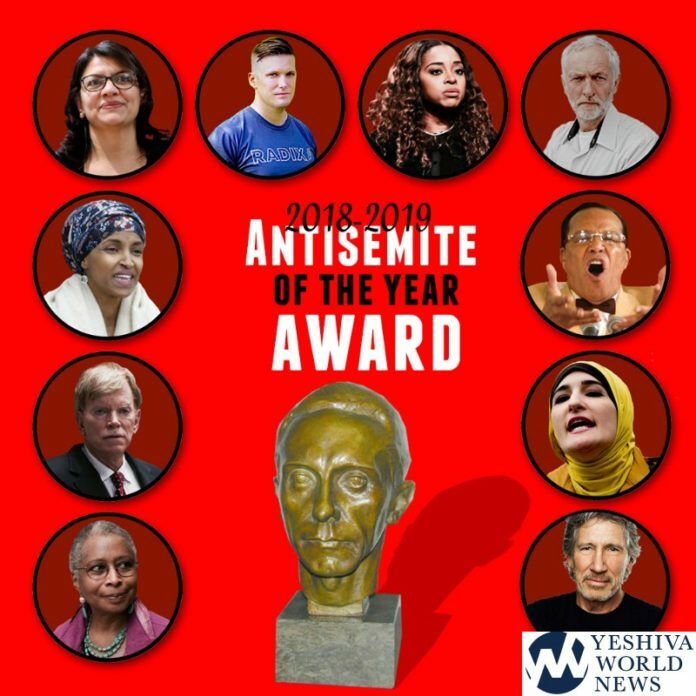 The ‘Antisemite of the Year Award’ campaign presents ten of the most notorious antisemites who are presented with one of their many offending statements that prove a consistent antisemitism. Online users can vote for any of the ten nominees presented or submit a ‘write-in’ choice. The winner, with most votes, will win the Joseph P. Goebbels Excellence in Propaganda Grant, a value of $5,000, which will go to helping the winner publicize their antisemitic comments through an online campaign. They’ll also get a signed bobble-Goebbels-head that spews out antisemitic vitriol every time you make him open his mouth. Every year, antisemites battle it out to be the most vile in their anti-Judaism. Time has come to acknowledge the greatest of the worst antisemites with the “Antisemite of the Year” Award. Who will win the “Antisemite of the Year” award? @IlhanMN? @RashidaTlaib? @LouisFarrakhan? @LindaSarsour? Or @jeremycorbyn? Winner will be announced tonight and will receive an autographed copy of Mein Kampf! All on the political left. clearly mr hikind you are definitely bored in retirement, this is silly and pointless and not getting anywhere in the result to quell anti antisemitism , eisav sonei lyaakov is a fact nothing will change that even if you write in fancy shmancy english to show that your educated and not from the shtetel (participatory,moniker) etc this gets you nowhere you can only speak out when incidents happen not stand on top of you head spitting wooden nickles complainng about anti semitism genuk shoin! What?????????????? Hes giving the winner $5,000???????????? IS THIS GUY NORMAL??????????????? They should all burn in Hell, each and everyone of them and their descendants. Amen! It seems that even in retirement, Dov cannot help trying to get media attention. The “moderate” and “tolerate” goyim themselves admit they hate Bnei Yisro’El. It’s just a matter of time until America will become like France with its antisemitism problem. Just see what happened in Pittsburgh , השם ירחם. I’ve realized in the past two years just how bad antisemitism has gotten, and concluded that the galus is not a place for a Frum Yid with real morals and values. Sadly, BOTH parties seem to be hung up on their usual partisan bickering and I have not heard much in the way of a real strategy from either to address the issue. Just a few hours ago, Pompeo finally got around to filling the position of Special Ambassador to fight anti-semitism to focus the Administration’s efforts in fightin anti-semitism throughout the world. The Dems seem unwilling to forcefully denounce some of their own members who invoke the usual code words for anti-semitism. We need more than “top 10” gimmicks from both sides of the aisle.